When grinding the rod journals, a steady rest is typically positioned to the side of the oil passage and tightened down to the grinding machine’s ways. Since the shoes ride directly on a journal, they must avoid the oil passage as a shoe may be drawn into the hole and damage the crankshaft and/or the equipment being used. Also, there must be adequate room for the operator to use the Arnold gauge to measure the amount of material being ground off. Especially on V6 crankshafts, where there is little side to side clearance, placing tooling and measuring devices on the journal at the same time can be quite a challenge. Once properly positioned, safely to the side of any oil passages and with plenty of room for the Arnold gauge, the automotive machinist then slowly tightens up the steady rest so that it supports the journal as it is being ground. As the machinist takes off more material, the arms are slowly tightened even more so that shoes remain snug to the journal throughout the entire grinding process. The steady rest is the one tool that resists the force created from the grinding wheel as it is slowly fed into the journal, which is an important function to produce finished journals of the proper size and microfinish. Once the first connecting rod journal has been ground, the steady rest can then be used to index over to the next rod throw. This is accomplished by locking the steady rest in position for the next rod journal and then indexing the journal over to the steady rest’s upper shoe until it stops. This will normally result in a journal that is within .010” of the position it needs to be in for grinding. Modern steady rests include dial indicators on them so that the machine’s operator can make minor adjustments to the crankshaft’s stroke and side to side positioning. After releasing the chucks for positioning, the operator will utilize a stroke gauge to make minor modifications to the stroke and adjust the side to side positioning by turning large industrial wing nuts. In addition to supporting the crankshaft journal during the grinding process, a steady rest also doubles as a shield to protect the operator from coolant splashing on him or her. Additional shields then may interlock on both sides of this device to provide complete coolant containment and protection for the operator. You can see a picture of a steady rest in use, with the splash guards in place, by viewing the image to your right. Please note that the journal being ground in this image is a main journal on a two cylinder crankshaft. 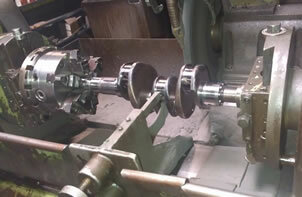 The steady rest is typically used in a fixed position when grinding the crankshaft’s main journals. The reason for this is to provide support at the center of the crankshaft since the snout is supported in the headstock and the rear flange is supported in the tailstock. In most cases, the center journal will be ground first so that the secure steady rest’s shoes will have a true journal to support grinding the remainder of the mains. This allows all of the crankshaft’s main journals to be true and properly aligned with each other and the seal surface of the crankshaft. If a steady rest is not properly secured on a journal while it is being ground, the journal will be out of round. It’s not uncommon for a journal to be .0005” out of round when the steady rest has not been used to properly support a ground journal. Even when used properly, the journal may still be out of round by .0002” as it nears its finish size. A good automotive machinist will see this out of round condition on the Arnold gauge and gently bump the top top steady rest dial, with his or her thumbs, to force the grinding wheel to take off more material on the high side of the journal. Even with a welded crankshaft, where the journal is still rough, the steady rest is still used. However, the steady rest’s arms are not tightened so that the shoes do not come into contact with a rough surface. Instead, the steady rest is used to protect the operator from potential grinding debris and coolant splashes. Once the welded journal has a smooth surface, then the operator can tighten the steady rest to support the journal with its shoes. When a crankshaft journal has been ground, there is often a slight mark left on the journal from the upper and lower steady rest shoes. These shoes, like the steady rest shoe pictured to the left, are made out of a special material that is comparable to a very thick and hard rubber. The shoes are non-abrasive, but do leave a slight amount of material on crankshaft journals that can be easily wiped off or polished out. When the shoes eventually wear out, they may be easily replaced and are actually quite inexpensive. Regardless, a new set of shoes will have a duty cycle that will give automotive machine shops the ability to grind hundreds of crankshafts. This duty cycle is a testament to the quality and durability of these important components. The primary purpose of a steady rest is to support the journal during the grinding process. 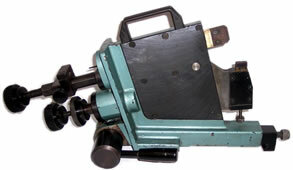 This gives the automotive machinist the proper tooling to avoid not just out of round conditions, but also chatter. Chatter can occur when the crankshaft grinding wheel comes into contact with a radius or counterweight. Additionally, an improperly dressed grinding wheel also demonstrates a heightened level of deflection and may produce undesirable chatter on the journals. With the correct tooling in place to support the journals, the operator is better equipped to produce a reconditioned crankshaft that is within proper specifications. Now that you have learned more about a crankshaft grinding machine’s steady rest and shoes, please consider rating the information you read on this page below.